In the 1970`s artists sold their work in an open air gallery on Leopoldstreet in Schwabing, Munich’s avantgarde district. These artists wanting an exhibition space to sell their work in the Christmas season, founded the Schwabing Christmas Market. They had help from the local council headed by Mrs. Edith von Welser-Ude. The beginnings were adventureous. The work was exhibited on pasting tables sheltered from snow stroms by sun umbrellas. In order to guarantee its longevity the artists formed a registered association, called „Schwabinger Weihnachtsmarkt e.V.“ Each member plays an active role in shaping the market. After the market is before the market! The decorations, the music and childrens entertainment programms have to be planned, just as the walk acts and advertising does. A jury of 11 association members choose the new exhibitors from the many applicants in order to ensure the high quality of artistic work. Flying high, yet down to earth- the Schwabing Christmas Market is a magnet for locals and visitors alike. 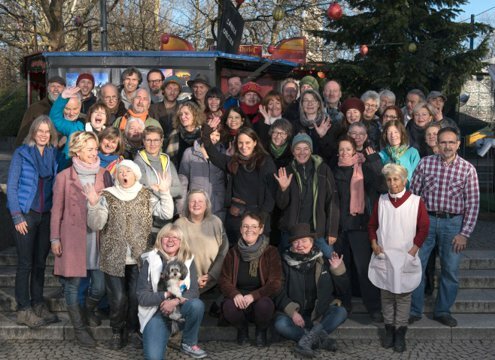 Over 80 artists and craftspeople coming from all over Germany have personally presented their fine crafts on the Schwabing Christmas Market since 1976. Discover handmade, individually crafted treasures.